NEWPORT, R.I. (February 22, 2017) – A one-of-a-kind ship with a special mission is now fueled with 20 percent biodiesel as it begins a voyage from New England to Florida, then on to Cuba in March. On February 21, 2017, the 200-foot Sailing School Vessel Oliver Hazard Perry took on 6,000 gallons of B20 at Newport Shipyard in Newport, Rhode Island. Completed in 2017, SSV Oliver Hazard Perry is the first ocean-going, full-rigged ship built in the U.S. in more than 100 years. It has the profile of an early 19th century vessel, but is a modern, state-of-the-art floating classroom hosting practical sail training as well as leadership development activities. 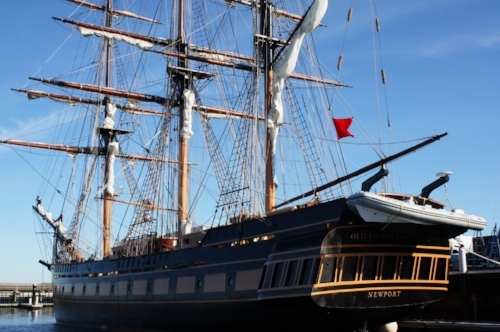 Newport Biodiesel, a biodiesel producer based in Rhode Island, provided the B20 blend to Oliver Hazard Perry Rhode Island (OHPRI) at a discount. The federal government categorizes biodiesel, a renewable fuel, as an Advanced Biofuel. Morton, a former oceanographer, volunteers on the board of OHPRI and also serves as vice chair of the marketing committee on the National Biodiesel Board. He sees big potential for American biodiesel for marine use. Biodiesel not only reduces greenhouse gas emissions compared to petroleum, but biodegrades in water as fast as sugar and is healthier for people to breathe. The ship is sold out for two round-trip voyages to Cuba in March that target high school and college students, but after that, the ship sails back to Newport from Florida, via Bermuda. During the two legs of that voyage (April 2-12 and April 14-22), adults have the opportunity to learn celestial navigation and study meteorology through courses offered in partnership with Ocean Navigator Magazine. T.H. Malloy & Sons, a progressive, family-owned energy distributor based in Rhode Island, fueled the ship with one of its own biodiesel-powered fuel trucks. Made from an increasingly diverse mix of resources such as recycled cooking oil, soybean oil and animal fats, biodiesel is a renewable, cleaner burning diesel replacement that can be used in existing diesel engines. It was the nation’s first domestically produced, commercially available advanced biofuel. NBB is the U.S. biodiesel trade association. Oliver Hazard Perry Rhode Island’s mission is to provide innovative, empowering education-at-sea programs that promote personal and professional growth. The mission is achieved by partnering with schools, organizations, and universities for unique experiential learning opportunities that incorporate STEAM (science, technology, engineering, arts, and mathematics) educational concepts. The non-profit organization offers a variety of onboard learning experiences to program partners as well as the broader public and also participates at festivals and other events to reinforce the importance of and interest in Rhode Island’s and America’s maritime history. U.S. Navy Commodore Oliver Hazard Perry led the first U.S. naval victory over the British in the Battle of Lake Erie during the War of 1812. For more information on SSV Oliver Hazard Perry and its programs, visit www.ohpri.org or contact gretchen@ohpri.org, 401-841-0080. Follow OHPRI on Facebook and Twitter for current news and developments.